As we begin the second week of trading in September, it is also important for currency traders to know that the performance of the EUR/USD and USD/JPY this month could set the tone for trading for the rest of the year. 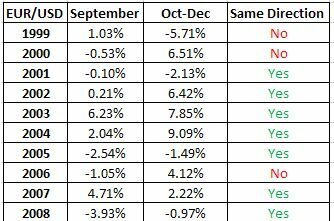 The following tables compare the performance of the EUR/USD in September with the performance for the last 3 months of the year. For the EUR/USD, in 7 out of the last 10 years, the currency pair’s performance in September foreshadowed the performance in Q4. 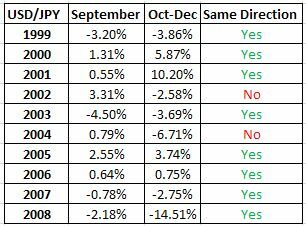 In USD/JPY, this pattern occurred in 8 out of the last 10 years.